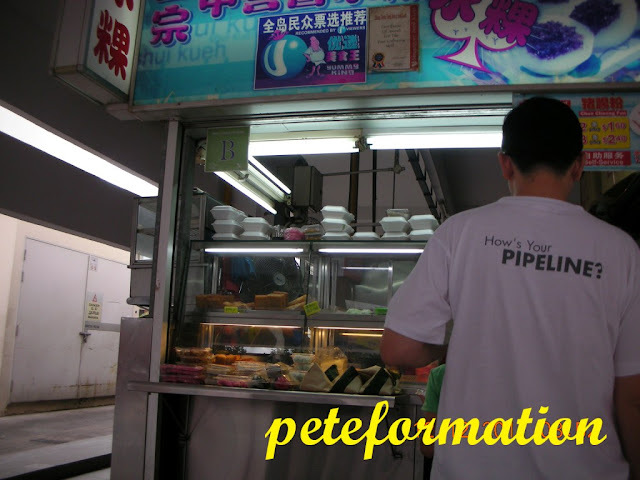 During our trip to Singapore, we wake up early on the third day to have breakfast at Marine Parade Market and Food Centre. 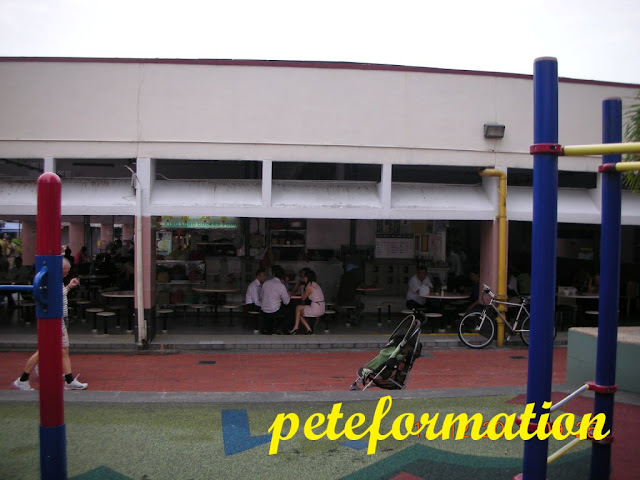 This food court is located in the heart of Singapore Marine Parade Central and you can find the map of this place here. 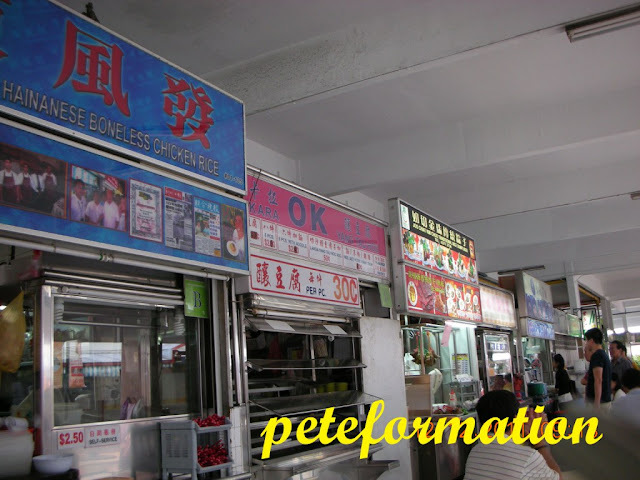 I love to eat at this food court because there is a large variety of food to choose from. There was a good morning crowd here when we arrived, mostly office workers having their breakfast. Each stall normally sells a few types of food. Lor Mee (Braised) noodle stall might also offer other stuff such as Hokkien Mee as well. My son came back with this packet of Nasi Lemak which he bought from a stall in the middle section that have a long queue. 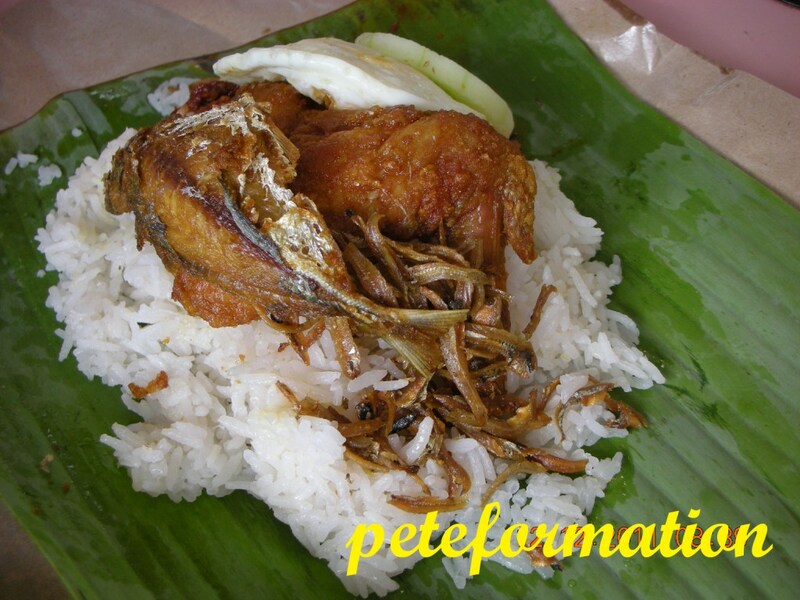 The Nasi Lemak (Coconut Milk Rice) looks very delicious with the deep fried ikan (fish) selar kuning and ayam goreng rempah (deep fried chicken with spices). He ate all of it in a jiffy! Must have tasted quite good! I could not decide what to eat and actually walked around the food court for at least 2 times. But when I wanted to order Lor Mee, the stall proprietor told me that the soup is not ready yet. 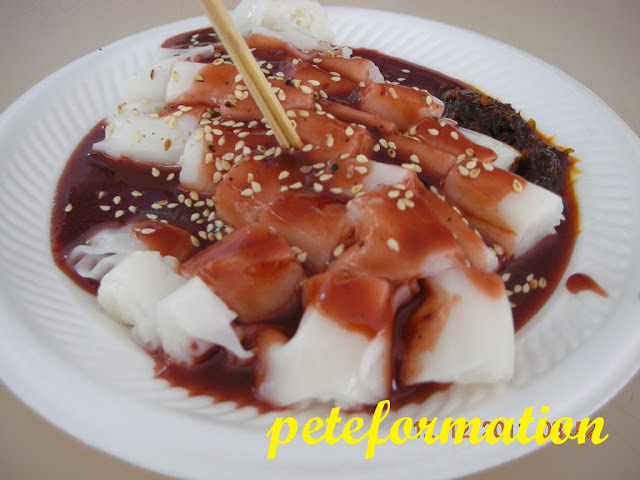 After that I manage to locate a kuih (local cake) outlet that sells chee cheong fun. I was eager to try it out and ordered two pieces. The sauce is lighter than Penang Chee Chong fun and there was no Har Ko (shrimp paste) in it. They used sweet bean paste (tnee cheo) or more popular known in Korea as Gochujang. Yum yum, I love it! The kuih (local cake) stall that I bought the Chee Cheong Fun from. My brother in law came back with some light snacks of Teochew Chui (Chwee) Kueh (Watery cake) which is actually a steamed rice flour based cake topped with spicy dried shrimp sauce. Very delicious except that I don't like to use tiny toothpicks to eat them. I dunno why they always serve this soft chui kueh with toothpicks?????? 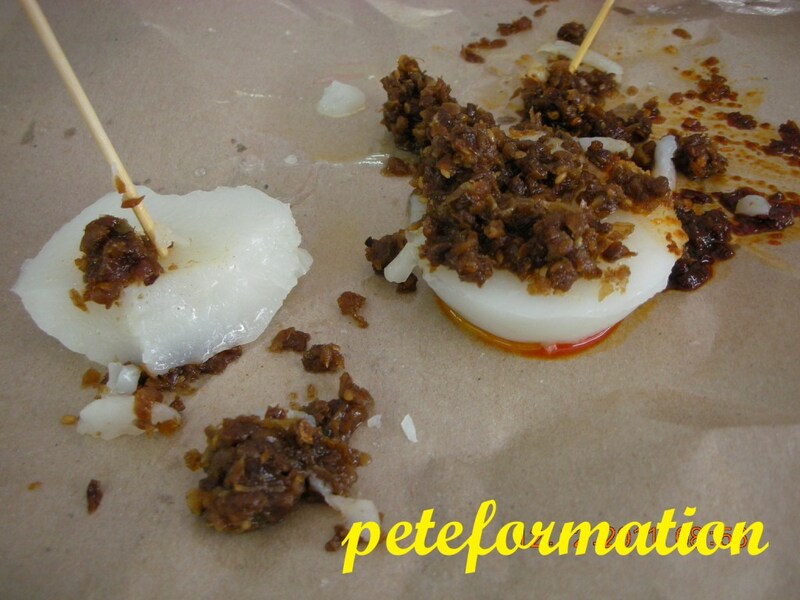 It is not easy to pick up this super soft kueh using the toothpicks! Nostalgia.........! My daughter looking at one of the exercise equipment in the playground outside the Marine Parade food centre. She played with it a few years back. She was 4 years old that time. Unfortunately the equipment leg paddle is gone now. Only left the top handle. 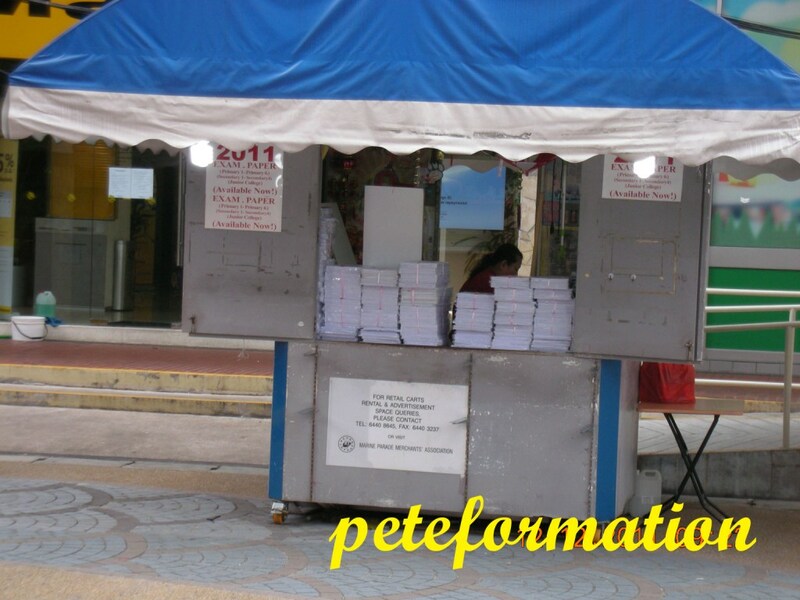 Hah, this stall selling Singapore Schools Examiniation papers is still around.....LOL! All the food looks good! I havent try the real Singapore cuisine yet, haha. Exam paper store? I couldn't find such store here, may be I can think of this business opportunity. Marine Parade? That's the reclaimed land area where the Big Splash is, right? 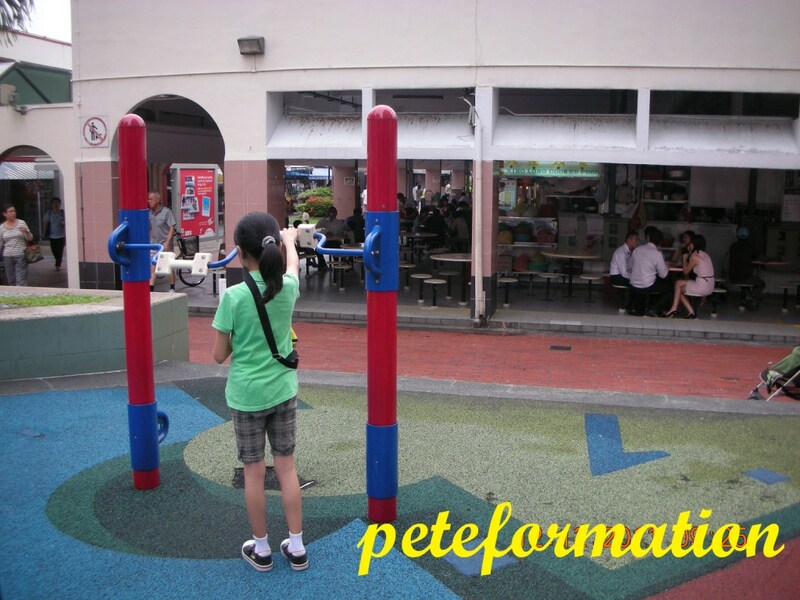 Wasn't there when I was in Singapore... Last time, Katong was by the sea. what a wonderful place! The food looks yummy, I would be there all day trying to choose. I like the watery cake..
Mee too, like the chwee kuih. I have an award for you, feel free to pick up when you're free. jumping over from Yummy Little Cooks. thanks for sharing your adventures in eating...love it!